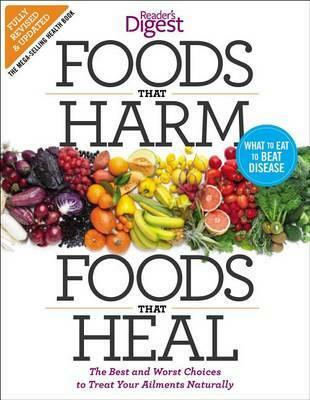 I had to check out the newly revised Foods that Harm, Foods that Heal which discusses how to treat ailments naturally. It's subtitled, "what to eat to beat disease" and that fairly accurately summarizes the purpose of the book. As a mom (and the one who makes the majority of food choices for our family) I thought this might be a handy book to have on hand - not because I think you have to eat a specific way to be healthy (because I don't). Rather, I think there are some basic common sense eating principles which are best observed for long-term health and functionality. Eliminating sugar is not my main goal as a mom, but I do think it's important to feed one's body foods which will help it to work as it ought, instead of effectively crippling it. To that end, I was curious to look into this resource. 1. Nutrition - This section takes a look at basic information such as how fats, proteins, vitamins and antioxidants both harm and heal you. This section also talks about how much one should be eating and how you can best prepare foods to serve your body well. 2. Food - Foods are listed in alphabetically order, from acorn squash to zucchini, and discusses the nutritional benefits or drawbacks in each one. 3. Ailments - This section discusses various ailments and what foods are most helpful to be eating and which are inadvisable. A lot of the information in this book is common sense. Then again, if you look around at society today I'm not so sure. Aside from general obesity, people suffer from many diseases and the medical profession is quick to hand out medications to treat our diseases and ailments as a general rule. As a mother I get a little concerned at the rate of which medications are passed off alongside a hasty diagnosis. We have a fairly conservative family doctor who we like very much, but if we can at all avoid going to see him we like to do so. (Not to say that we avoid going. We've racked up our fair share of doctor visits! I'd rather be safe than sorry!) However, once a diagnosis is given I like to find natural ways to combat the issues in front of us, be they allergies or the common cold, alongside medicines when they are truly needed. I have to say that I mostly appreciate Foods that Harm, Foods that Heal for the way it breaks down the benefits of particular foods. For example, in taking a look at avacados it lists what a typical serving size should be and how many calories are contained therein. It lists the way that avacados can harm you (i.e., weight gain, allergies) and how they heal (high cholesterol, heart disease, cancer, blood sugar swings, insulin resistance, hair). There is a discussion of the health benefits and the risks. Lastly there are eating tips and buying tips related to this food item. The same overview is given for each food item contained in this book. Spread throughout the book are various statistics on heart disease, particular diets and also quick tips on how to prepare food without wasting any of the parts, or how to beat exhaustion, etc. I do like the book because it gives me a starting place to references what foods will be beneficial to feed my family as we pursue general health. I will be keeping this book in the cupboard with my recipe books for quick perusal. I view it as another tool to make me a smarter mother when it comes to feeding my family well. Grateful for a chance to check this book out. Thanks to Goodman Media who sent a copy of this book my direction in exchange for my honest thoughts. I like the idea that it breaks down the benefits of specific foods, that is helpful indeed. This sounds like a good book to have on hand to peruse. Sounds like an excellent resource. Another one that would be very helpful. I'll have to add this to my shelf at some point.